Whitehall Media are pleased to announce the return of their annual CGBT Conference set to be held in central London at the Victoria Park Plaza on the 25th September 2018, register now to attend. The conference will feature an impressive line-up of senior civil servants from central Government departments such as Matthew Coats, Director of Implementation and Coordination for the Cabinet Office, Andrew Russell, Deputy Director of Digital Capability, Digital Data and Technology Services, Department for Environment, Food and Rural affairs and Jem Eskenazi, Chief Technology Officer for UK Export Finance. Morgan Frodsham, Transformation (EU Exit) Lead, Government Digital Service will be kindly chairing the day for us. The day is sure to be filled with exciting discussion and debate from across all government departments with new topics being added to the programme every week. The day will cover emerging trends and the hottest topics within central government from a number of different departments and bodies, all bringing real life examples of how they are transforming government internally and making each department consequently more efficient, accessible and easy to use for both internal staff and client users. Other topics for the day will include: using ICT to deliver and enable public sector innovation and reform, building digital capabilities and harnessing digital leadership and ensuring services are responsive and adaptive, improving experience for citizens, businesses and users within the public sector and bridging the gap between policy development and service design. The conference will feature a presentation from Michelle Parmenter, Deputy Director Finance Shared Services and Technology from The Cabinet office on how government shared services is working to create a single process for use by government departments to ensure they apply best practice in the use of ERP Systems. Max Tse, Executive Leader, National Audit Office will be looking into the benefits cross-government data sharing and exploring the benefits of collaboration between departments and bodies, as well as improving access to specific data analytics tools and techniques to better manage complex datasets. 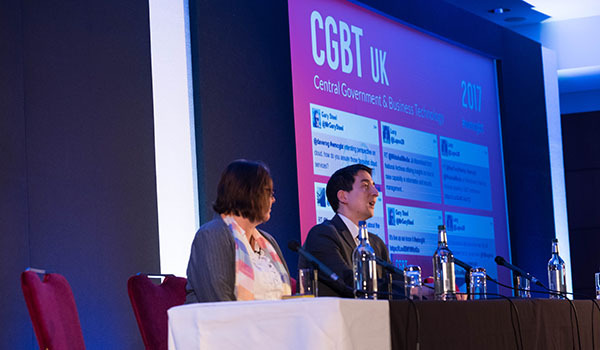 The CGBT event is an excellent opportunity to network with senior civil servants, hear the latest developments, and learn from their challenges as well as their triumphs. We will be holding numerous Q&A panel sessions with our guest speakers and chair on the main stage which will give you a chance to ask what you really want to know! There will also be plenty of exhibitions stands to visit along with several in depth seminars ran by experts which will allow you to access brand new technology which may just be the solution you are looking for in your workplace. Whitehall Media’s conferences are extremely unique in comparison to other providers, welcoming thousands of delegates through our doors yearly. We specialise in both public and private sector technology conferences with our in house programmes team who specifically spend months researching and writing conferences to make them truly innovative and ahead of the curve, so our delegates can develop professionally and accrue CPD points for attendance. Register today to attend.